Cambridge™ Confirmation robes are an exceptional value. High quality at an affordable price. 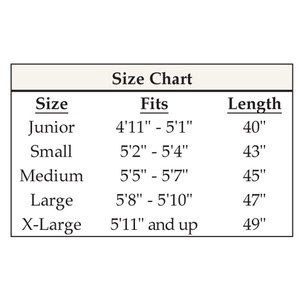 Available in Red or White, specify color and size when ordering, see size chart for details. This item is not regularly stocked in our Colorado warehouse and will ship to you directly from the manufacturer. Your order for this item will be processed within 48 hours of our receiving it and transmitted to the manufacturer for fulfillment. In most instances, this item is regularly stocked by the manufacturer and should ship out to you within 1-3 days of your placing the order. You will be notified by us via email should shipment be delayed by the manufacturer for any reason. This item will ship via standard FedEx, UPS, or United States Post Office. Depending on your delivery location, it usually takes 2-5 business days for your order to arrive after it has shipped. Please keep in mind that once your order leaves the manufacturers' warehouse we have absolutely no control over when it will arrive. We will always be available to help you in tracking your order should there be any delays in its' delivery. We cannot be held responsible for orders that arrive to you later than your expectations. Feel free to contact us if you need special assistance on when you might expect to receive your order. Expedited Shipping Options This item may have Expedited Shipping options. Please look underneath the "Add To Cart" button on the right hand side of this page to see if it can be expedited. Because this is an item that is drop shipped directly to you from the manufacturer, you will need to plan on adding an additional day to any Expedited Shipping option you might choose. The reason for this is that we need some time to process your order in our location and communicate it to the manufacturer. This can take a number of hours, depending on the manufacturer and their location, along with their specific cut-off times to process special delivery orders. All Christian Brand products are selected with care to meet their high quality standards. This item carries the manufacturers 100% satisfaction guarantee. if you are unsatisfied with your purchase of this item, simply let us know and we will make arrangements for you to return it. Should you wish to return the item(s) you bought - call us within 30 days of your purchase and let us know what items(s) you would like to send back. We will provide you with the information needed to return it. We will also issue you a Return Authorization number. DO NOT return any item to us or the manufacturer without this number. If you do, you very well might not receive credit for the item(s) you returned. All items must be sent back in a shipping box. You cannot label and ship back to us the interior box that the item(s) are stored in. You are responsible for the shipping and insurance costs of returning an item to us. Refunds will be given once we have received the item and determine that it is resalable. Any shipping costs charged on the original order will not be refunded. The Return Authorization number needs to be written clearly on the outside of the box you are returning as well as written on a piece of paper and placed inside the shipping box. For DAMAGES or ISSUES WITH YOUR ORDER- call us immediately and let us know what is wrong. You have 10 days from receipt of your order to claim a damage or to let us know if there was something wrong with your order. Christian Brands has served the Christian community for over 60 years with a wide variety of church goods. They are a Catholic owned and operated company with a heritage rich in tradition and a commitment to offering the finest selection of church goods to both the Catholic and Protestant communities. Their offices are located in Phoenix, Arizona while their warehouse facilities can be found in Lewisburg, TN.